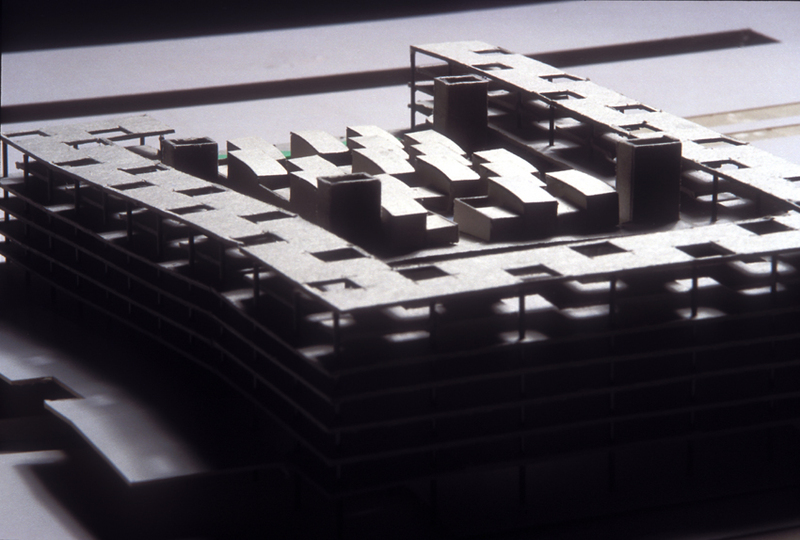 Generic Box Prototype is a theoretical project for a mixed-use housing, office, and retail complex in Rotterdam. It was designed as part of a 1994 design studio at the Berlage Institute Amsterdam (instructors Henk Döll and Francine Houben, project collaborator Miriam Arcas) commissioned by the City of Rotterdam to seek proposals for the city’s de-industrializing old port, the Kop van Zuid. Loosely inspired by that city’s Groothandelsgebouw (by Hugh Maaskant and Willem van Tijen) as well as by Place Bonaventure in Montreal (by Arcop), the proposal takes the form of a superblock perforated by courtyards and containing, in the centre, an extra-large service core that includes a parking garage (underground parking is costly and complicated in the Netherlands). The building’s vast rooftop, which slopes very gently toward the sea, is populated by dozens of compact patio houses along with some communal spaces. Shops occupy the ground plane, while offices occupy the floors between the shops and the roof-top patio-houses. The ramps of the parking garage match the slopes of the gallery system by which offices are accessed, so that it is possible to park a vehicle on the same level as a particular office. The roof-top housing has its own ground-floor lobby in a courtyard inside the superblock. Two such blocks are positioned on the site side-by-side, with subtle variations on the ramping theme. 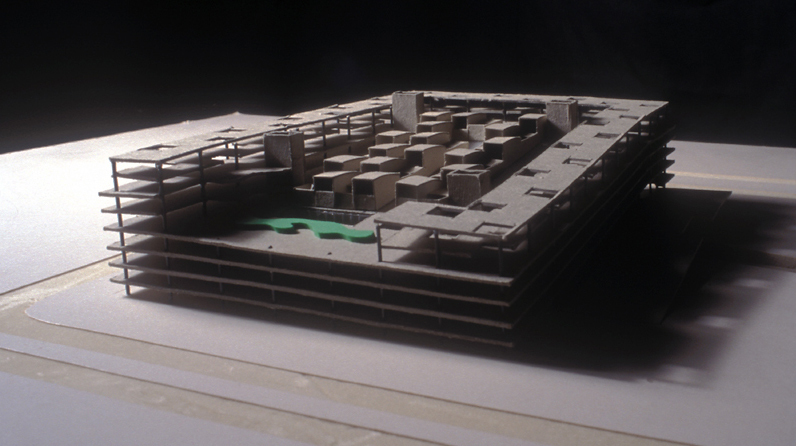 Massing model of urban design proposal. 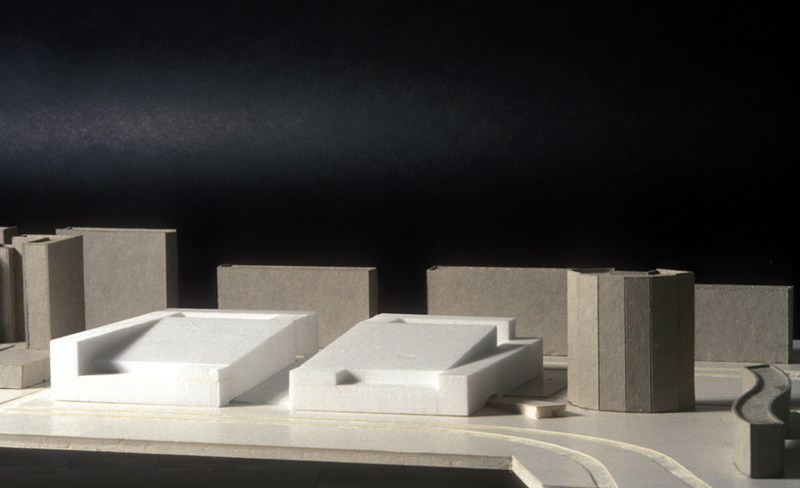 Architectural model of one of the two blocks that comprise the urban design proposal. Architectural model showing rooftop patio houses. “A harbor view for everyone”. Schematic plan showing building core –with parkade– separated from perimeter block by courtyards. The harbor is toward the bottom. Schematic longitudinal section showing patio houses over parkade, courtyards and perimeter building. The harbor is to the left. Schematic elevation. Units step upward right to left at same slope as parkade. “Form follows parking”. Rooftop patio house unit plans. Left: two upper floor plans. Right: two lower floor plans in different configurations. 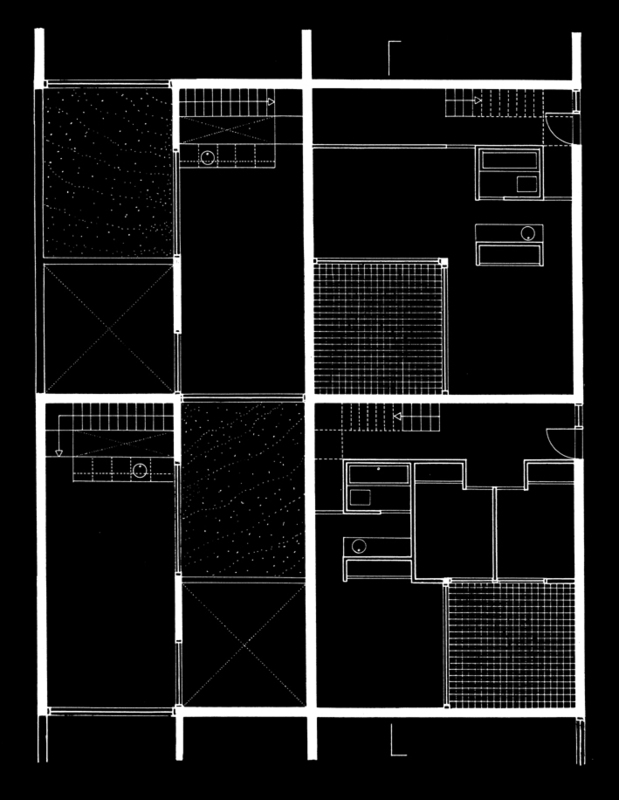 Section through two patio houses that cap the parkade, showing sight lines over neighboring rooftops.